The Bald Eagle, considered a sign of strength since the times of the ancient Romans, has been our national symbol since 1782. Fun fact: Benjamin Franklin, in a letter to his daughter in 1784, described the bald eagle as “a bird of bad moral character”. This regal bird has now become an icon symbolizing American strength and fortitude. Bald Eagles are also known as one of the most notable conservation accomplishments of the 20th century. Due to heavy use of the pesticide DDT after World War II, the eagle population fell into steep decline. The pesticide accumulated in eagles causing them to lay eggs with weakened shells which caused devastation among the eagle population across the United States. As a result, the eagle became one of the first species protected by the Endangered Species Act in 1973. In Maryland, the numbers of nesting pairs has risen from a low of 44 pairs in 1977 to at least 700 nesting pairs today. 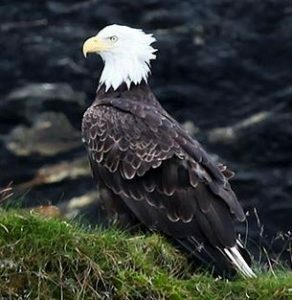 The Bald Eagle was removed from the Endangered Species List in 2007 but remains under the protection of federal law prohibiting “killing, selling or otherwise harming eagles, their nests or eggs”. 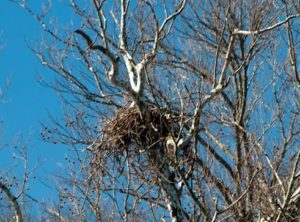 The C&O Canal is home to numerous Bald Eagle nests and nesting pairs that build massive stick nests, that are reused year after year, in the tops of trees. Bud Cline, Ph.D., is a longtime volunteer with the C&O Canal National Historical Park and the C&O Canal Trust. 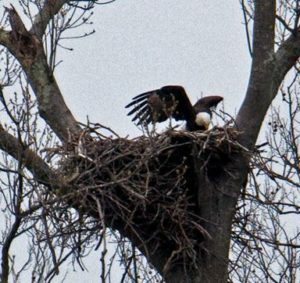 Through the years, he has documented several Bald Eagle nests located in the Park from Georgetown to Seneca Creek. Those locations include Three Sisters (mile 1.7), Virginia Shore (mile 6.25), Vaso Island (mile 10.5), Conn Island (mile 15), Sycamore Island (mile 18.5) and VA Shore (mile 21). According to Bud, the nests at mile 6.25 and 15 are the easiest to view and usually have the most activity. Bald Eagles can also be regularly spotted soaring high above the towpath in the Park’s Big Slackwater section near Williamsport and are a welcome sight to Park visitors.